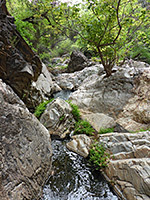 Like Oak Creek Canyon to the north, Cattail Canyon is a major ravine on the west side of the Chisos Mountains in Big Bend National Park, starting in the high country over 6,000 feet and descending steeply to the desert plains below. Oak Creek has a popular trail, leading to the Window, where the drainage falls vertically away by 220 feet, but in contrast Cattail Canyon is largely inaccessible owing to steep sides and a number of intervening pour-offs, though it may be explored with use of ropes. 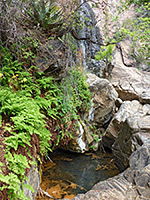 Only the lowest section of the canyon is easily visited, by the 1.5 mile Cattail Falls Trail, which crosses undulating hills and enters a dense patch of woodland enclosing a small stream that flows through a enchanting series of pools from the base of an 80 foot waterfall. 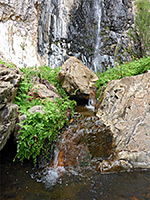 The reddish rocks of the cliff face behind the falls are streaked with white and black, partly surrounded by rich green vegetation, and the whole place is very beautiful but also delicate, home to unusual plants and a variety of wildlife. In midsummer the falls may be completely dry but most seasons have at least some water. Partly to protect the fragile environment by limiting visitor numbers, the trail to the falls is not marked on the NPS map of the national park, and the trailhead is not signed from the highway. The trail does have a sign, half a mile from the parking area along a gravel track, accompanied by a notice detailing the care needed when visiting; advice includes not to wade in the pools, the need to stay on the path, and to walk on the rocks rather than earth when in the vicinity of the falls. 15 views along the trail. 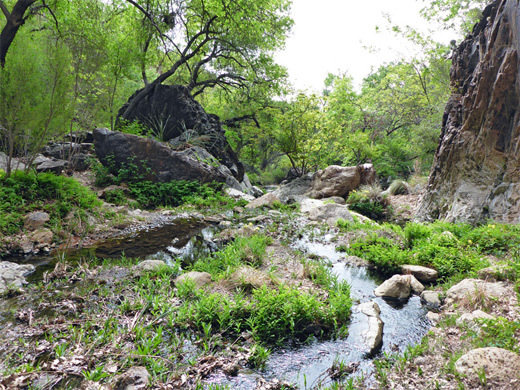 Parking for the hike to Cattail Falls is the same as for the Oak Spring Trail - 1.3 miles along an unsigned, reasonably good quality gravel track that forks east off Ross Maxwell Scenic Drive, right opposite the pull-out for Sam Nail Ranch. The track continues 0.9 miles to a water storage facility at Oak Spring, but is blocked by a gate just after the parking place. A half mile walk reaches a sign at the start of the Cattail Falls Trail, in the shady, tree-lined corridor of Oak Creek; a horizontal trunk of an aged oak tree provides an ideal place to sit and rest for a while. This sheltered location was once the site of a homestead, and the tree was constrained to grow in this orientation by being tied down when young. The path to the waterfall heads south, soon climbing out of the woodland and ascending via many little steps, alongside a minor drainage and up a stony slope to a saddle, then descending slightly and crossing a flat, area, sparsely vegetated with bushes, agave and cacti. After 0.6 miles it reaches the rim of the wide, shallow but sheer-sided valley of Cattail Creek, which is followed eastwards, round a corner, where the falls can first be heard and seen, just above a patch of trees at the base of a line of cliffs. The trail continues on the rim a little way before dropping down to wooded land on the valley floor, then it approaches the stream and ends beside the sizeable pool at the base of the falls. The creek usually flows just 1000 feet or so before the waters sink below ground. All around are beautiful colors and textures, of the rocks, the water, and the vegetation, which includes at least three unusual flowering plants - yellow long spur columbine, red cedar sage, and greenish red stream orchid; columbines are particularly abundant. 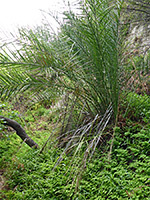 Several species of ferns grow beside the pools, and at least one date palm, while the canyon is filled with large oak trees.